Feeling happy? This Christmas card is sure to make you smile! Send holiday greetings the easy way, with an adorable penguin card printable. 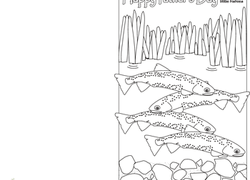 Filled with little fishies, this printable Father's Day card is sure to make Dad smile. Plus, it gets in a little coloring practise for the kids! Give your child a fun way to learn how to send thank you cards in the mail! She'll get to colour a cute card herself, a great way to delight friends and family. Wish friends and loved ones a happy birthday with this adorable elephant greeting card your child can colour himself! This blank snowman card will let your child practise his writing skills this winter. Spread Chanukah cheer this season with a homemade card, personalized with a special handwritten greeting. This two-page printable features the Star of David card design in festive blue, or in black and white to add your own colour to. Wow friends and family with a hand-made thank you card! Your child will love coloring and decorating this printable herself. 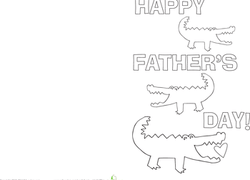 This cute, crocodile-filled card will have Dad smiling, and it's a fun activity for kids, too! Looking for a card for Dad's Day but don't want to go the store bought route? Try this printable do-it-yourself card featuring a Dad and son flying a kite! Your child can illuminate a little holiday cheer with this greeting card coloring page, wishing peace on earth.